This quick and easy grilled chicken recipe uses the new Asian Sensation Spicy Sesame Ginger marinade to give it that genuine oriental flavor (repeated again below). 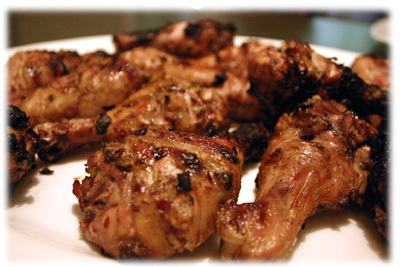 I find this type of BBQ chicken recipe works best on smaller pieces like drumsticks and bone-in thigh pieces. The nutty flavor of sesame oil combined with the tang of fresh ginger brings an Asian sensation to your grill. Let the meat marinate overnight if possible. Save the marinade, heat to simmer and use as a basting sauce for this grilled chicken recipe as it cooks. Tip: for best results marinate 4 hrs up to overnight. 4 lbs of drumsticks skin on (about 24 pieces). 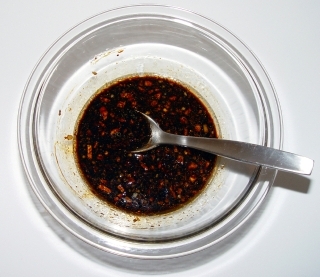 In a medium glass bowl mix first 11 marinade ingredients well with a fork or a whisk. Make several slices in each drumstick with a sharp knife. 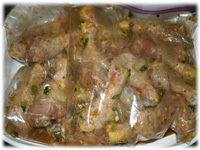 Divide the marinade equally between the two bags (3/4 cup each bag). Seal the bags and rotate the bags several times to evenly distribute the liquid over and between the pieces. Place the bags in a large dish (in case the bags leak!) and put in the refrigerator at least 4 hours but best if left overnight. 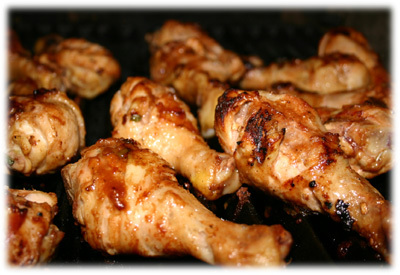 Pre-heat the grill to 400F direct heat and oil the grates to help prevent the drumsticks from sticking. Remove the chicken from the bags. In a small saucepan add the leftover marinade and bring to a gentle boil over medium heat. Add 1 teaspoon of cornstarch to enough hot water (several tablespoons) to make a slurry. Add this cornstarch slurry to the simmering marinade recipe. Cook several minutes until the liquid thickens and becomes suitable as a basting/glazing sauce. 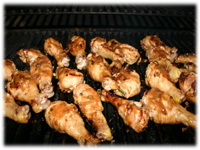 Place the chicken on the grill and brush with the cooked basting sauce. Grill 10 - 12 minutes per side and turn the pieces only once. Brush often with the sauce. 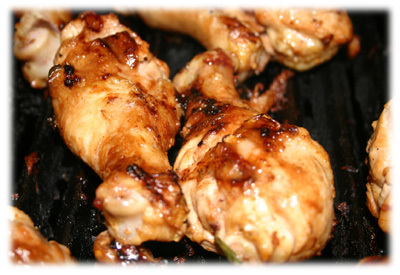 Remove the grilled chicken when no longer pink near the bone and juices run clear (not pink). Tip: Only flip the grilled pieces when they come away easily from the grill, if they're sticking then it's not time to flip. An upside down flipper works best to ensure chicken comes away in one piece from the grill. Remove the grilled chicken to a serving platter, sprinkle with thinly sliced green onion and cover with foil for 10 minutes before serving.